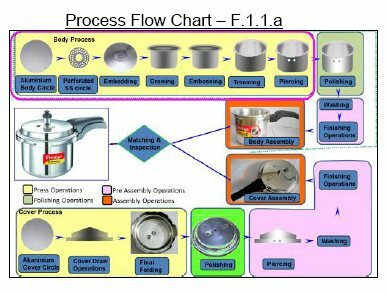 The below picture F.1.1.a shows the Process Flow Chart of Outer Lid Alu. Pressure Cooker for our easy understanding. In this Process, we would like to improve the Productivity by eliminating Man and Machine efficiency Losses. For that, we followed the below methodology as mentioned in the Table –T.1.1.a. To understand the current situation, section wise Productivity values calculated and tabulated as below in the Table – T.1.1.b. Based on the Bench Mark Productivity, we fixed the Target for next 4 years as below in the Table –T.1.1.c. 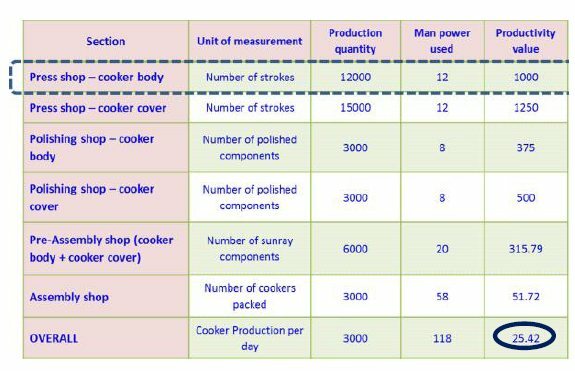 We selected our Cooker Body- Press Shop section to improve the productivity on priority where the scope is sufficient. Hence our Theme is "To improve the Productivity at Press Shop Cooker Body Area". We did analysis and identified that Set Up and Adjustment Loss, Line Organization Loss and Line Distribution Loss relevant to Machine Side and Fatigue Loss, Non-Value Added Losses from Man Side are predominant. Actions initiated to identify the causes and implementing countermeasures. There are 4 stages in Alu.cooker body process and they are First Draw, Final Draw, Embossing and Trimming. 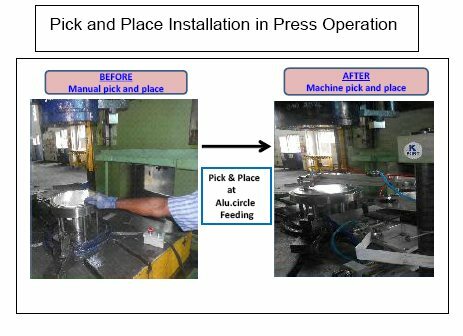 We had 2 presses only and hence 3rd and 4th Process were carried out after the completion of first 2 processes by changing the tools, which is a Batch Process and consumes about 12 Manpower with the maximum strokes per press is about 12000 No’s. The batch process eliminated by installing two more presses in the line and made as SinglePiece Flow resulting the no.of strokes improved to 20000 from 12000 no’s, manpower reduced to 11 from 12. This leads to increase in Productivity from 1000 to 1818. Manpower required reduced to 7 from 11 and they deployed in other areas. No.of Strokes per Manpower increased to 2866 from 1818. Similarly, about 532 kaizens identified and implemented in all sections and the Productivity improved to 25.70 to 30.70. 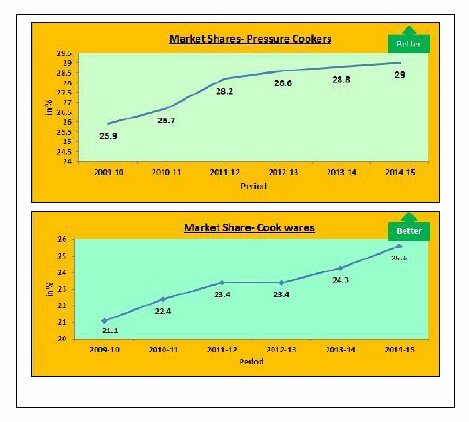 Then, Production Demand increased to 10000 Cookers Per day. Option of operating another shift to meet the production demand is not accepted by the Management because of New Manpower recruitment, changes in various infrastructure etc. It was decided to implement the Process Razing Kaizens to meet the demand. In the Cooker Body Process area, now we had 6 presses for doing the 4 stages of processes. The trigger was made to complete the Cooker Body operation in 3 stages so that we can double the production with the existing 6 presses. The existing set up of Presses is given below in the Table T -2.1.a and we fixed the Targets. 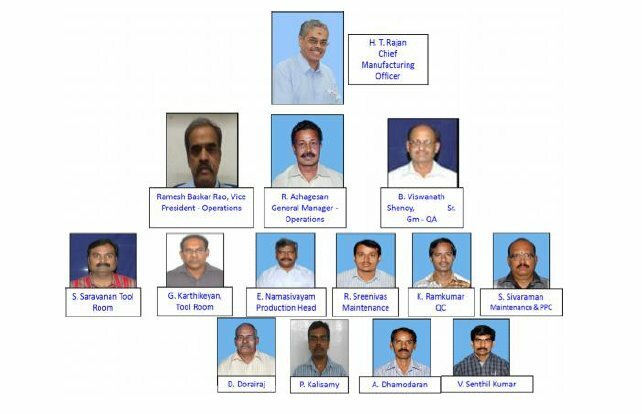 We formed the Cross Functional Team comprises of Top Management, Corporate and Site Tool Room, Site Operations and Shop Floor Team and it is given below in the Fig – F.2.1.b. Let us explain the Alu.Cooker Body formation in sequence. 1. First Draw: Here, the raw material Alu.Circle is formed into 70% of cooker body by drawing operation and the Batch Coding also done in the cooker body base. 2. Ironing: This is the wrought operation. Here , the material is squeezed from the wall to achieve 100% draw and the cooker capacity is achieved. 3. Embossing: This is a cold- forging operation. Here, the flange flattening is formed and the thickness is evenly formed. It is one of the Quality parameter to maintain the cooker bursting strength. Also, leading edge is formed in the Cooker body lug area, important for smooth open/ close of the cooker lid. 4. Trimming: Here, the cooker body is inversely kept in the press to cut the excess portion in the lug area. Now, the cooker body is fully formed. Here, we are consolidating all the 4 stage operation in a schematic diagram in the Fig – F.2.1.c. We did Brain Storming to identify various possibilities as in Fig- F.2.1.d. "Conquer the Process. Challenge the Product". With the further motivation, we did the analysis and discussed. One idea was generated that why we need to combine two different operation?. Instead, can we split the operation and try? This idea shared to the concerned and started to develop the concept accordingly. During Ironing Process, we can do Flange flattening. 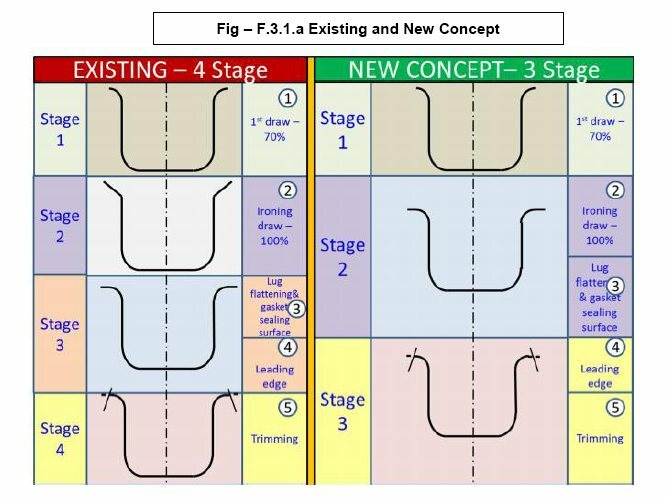 So, the activity of Flange flattening and Gasket Sealing Surface forming moved to Ironing Process. During Trimming, Leading Edge can be done. So, Leading Edge Formation activity moved to Trimming Process. 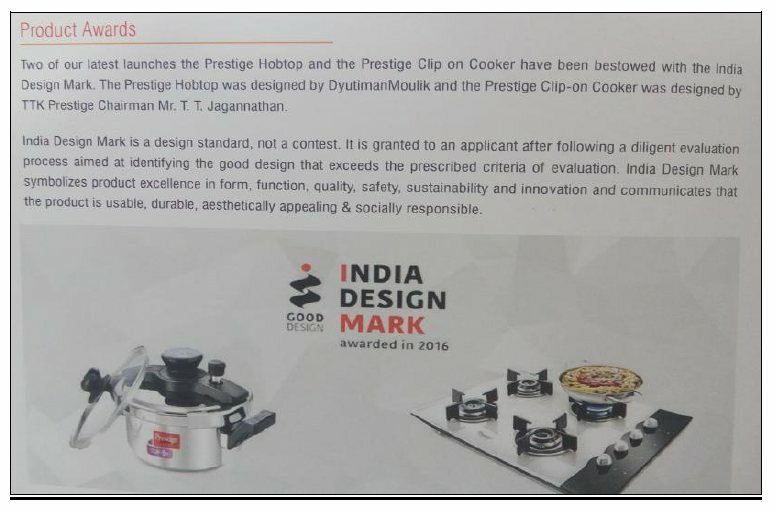 So, Embossing Process is eliminated and 3 stage Process of Cooker Body formation can be achieved. The concept also approved to execute as per the methodology drafted. The above statements are pictorially explained for easy understanding in the below Fig – F.3.1.a. After the approval of the concept, we listed out the Challenges what are all existing to achieve the task. Reg. the Press Capacity, we calculated the Capacity at each stage and confirmed that existing capacity is meeting the requirement. Hence, the first issue overcome. Now, the challenge started in Tool Modification. It was decided to do all Tool modification in our in-house tool room only. We did changes in the Ironing tool with 90° angle at 8R Radius. The 90° angle is required for Flange flattening and 8R Radius is for to form the Gasket Sealing smooth surface. By doing this, we achieved the requirement in Ironing Process completely. The next challenge is Trimming Process. We interchanged the die and Punch in the new trimming tool with additional stripper to get Leading Edge Formation. Leading Edge formed but we have got one more constraint that the cooker was not ejected from the tool. Found no possibility for the automation. Here, we challenged the traditional form of Trimming operation by changing the die and punch in upright position. Modified the spring loading for perfect cushion ejection to facilitate the autofeeding by installing Pick and Place Mechanism. The typical change in the tool is explained in the below Figure – F. 4.1.a.With this, all tool modification completed and specification approved. Trails were started and it also conducted in the presence of our Group Chairman in the Fig- F.5.1.a. Trial samples given to Lab for testing and Passed in all our Test. And commenced the Mass Production. We achieved the Results as desired and the same is given below in the Fig – F.5.1.b and Fig – F.5.1.c. The improvement what we did registered in Kaizen sheet for the documentation and for Horizontal Horizontal deployment at other areas. By implementing the above, the benefits we achieved are reasonably good. Especially on Cost and Delivery, the below are quantitative results. One Press available as Spare, can be used for other Production which doubles the Production capacity. Concept of "Thinking Out of the Box" improved at all levels. This morale boosted among the employees and it was presented to the JIPM Assessors during the Excellence Category Award Assessment and appreciated the efforts taken by us. This is shown in the Fig- F.6.1.a. The Machines/ Equipment have now been transformed into Smart Machines with appropriate sensors &automations. This will help us to progress into Industrial IOT connecting all machinesinto the cloud to reap the benefits of Concurrent Engineering for fater New Product Introduction, Energy Savings, improving OEE etc.